Every year, there’s hundreds upon hundreds of launches but only a handful of these can command the attention that Apple gets on the launch of it’s iconic iPhone line. That day is today, September 12 when the ‘Gather Round” event takes place at the Steve Jobs Theater. Last year we arguably saw the biggest overhaul of the decade-old iPhone line with the iPhone X. This year we’re getting an evolution of the same philosophy that made Apple top dollar. The Cupertino giant was expected to announce three models this year, and it has not disappointed. Hours before the launch we came to know about the monikers or names of the three models. And we warn you, whether you like it or not, you’ll have to get used to it. 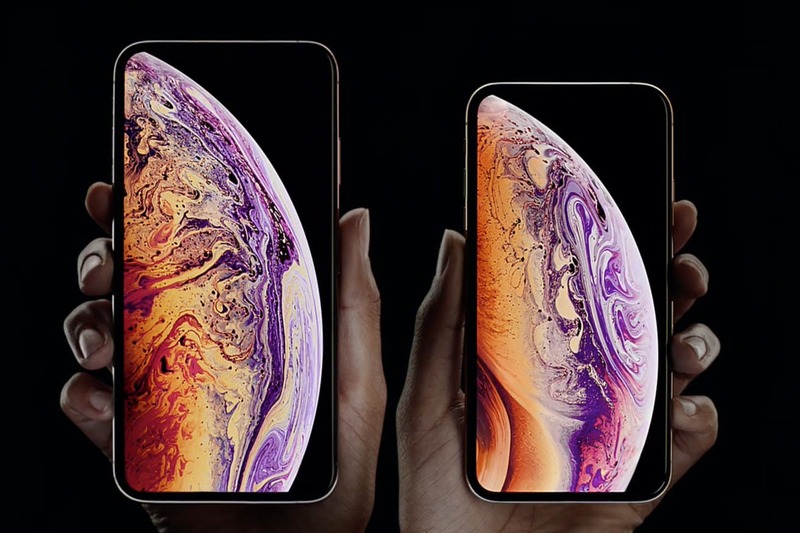 They are the iPhone Xs (5.8-inch), iPhone Xs Max (6.5-inch), and iPhone Xr (6.1-inch). While it’s written as “Xs”, do note that Apple pronounces it as “10s”. The iPhone Xs and iPhone Xs Max are the real successors of the iPhone X. As the name depicts, the Max is a super-sized version of the Xs with a massive 6.5-inch OLED screen, bigger battery and a few more changes. At the base, both are basically the same with same core components. Talking of design, there isn’t much of a change and we expected this from Apple. So, we’re seeing the previous stainless steel and glass sandwich design and for good or bad, the same notch. 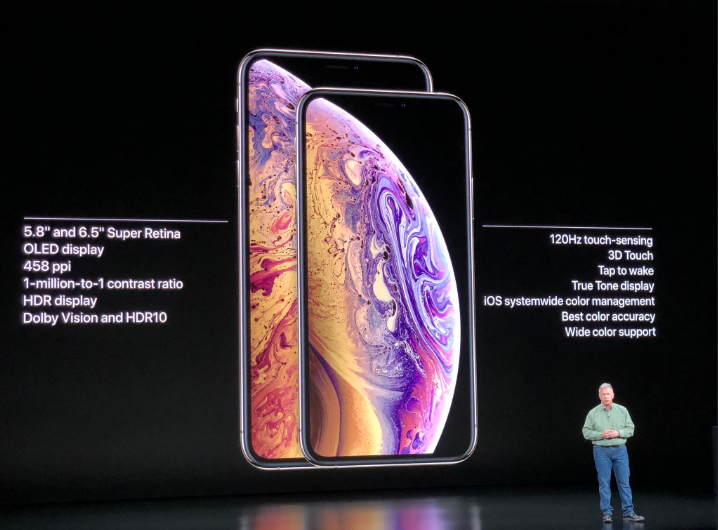 Both the Apple Xs and Xs Max come with a powerful A12 bionic chipset with 4GB of RAM. It’s based on a 7nm process and also has a neural engine. Apple said the chip is 50 percent faster than the previous generation. The 5.8-inch Super Retina OLED display on the iPhone Xs has a 2436 x 1125 resolution making it a really sharp panel. On the bigger model, the iPhone XS Max, the 6.5-inch OLED screen still has a slightly higher 2688 x 1242 resolution. Both the handsets share the same 458ppi. Apple also announced that the new iPhones have Stereo Sound for a much better audio experience. The company also said that Face ID has been improved to be faster but didn’t quite dive into it much. However, it did elaborate a bit on the neural engine saying it helps apps open 30 percent faster. 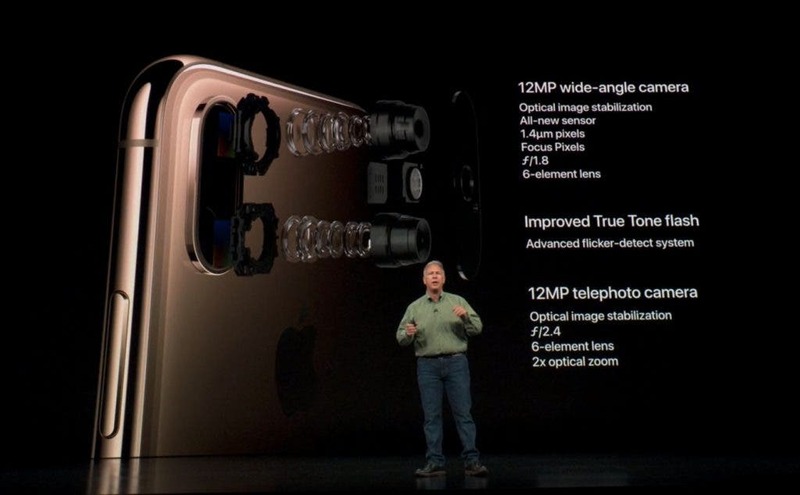 The camera is also the same on both of the new iPhones that will be grabbing headlines for the coming few months at least. There’s a dual 12MP camera at the back of both the phones. 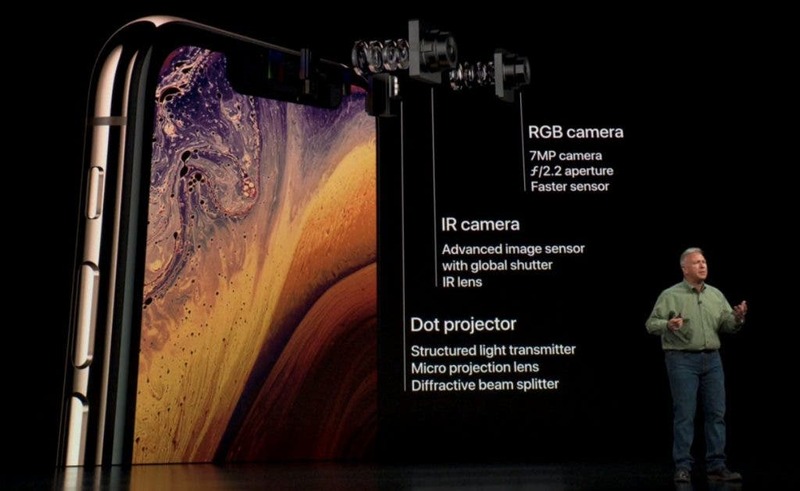 Apple introduced something called Smart HDR that uses the A12 Bionic chip to make zero shutter lag, 4-frame buffer, and capturing interframes. Both iPhones also are now better at resisting water – IP68 rated. 3D touch also sticks around as expected. Apple didn’t announce the battery size but it said that the Xs has 30 minutes more battery while the Xs Max has worth an hour and a half more juice. The front 7MP RGB sensor for selfies is also improved to some extent. Moreover, a big announcement was Dual SIM for iPhones. However, not both will be physical. One will be an E SIM. This is the first time iPhones are getting the feature so it’s a big deal. E-SIM support was also announced and Apple is working with carriers to bring it to the US by the end of the year. In China, however, there will be two physical SIM options. Both the iPhone Xs and iPhone Xs Max have three variants – 64GB/256GB/512GB exactly like it leaked some hours before the launch. iPhone Xs, Xs Max comes in a new glittering Gold colour besides the regular Gray and Silver. Stay tunedfor prices and availability. We will be bringing you more details regarding these new products tomorrow.